Hi, my name is Chris Watkins, from Seattle, Washington. 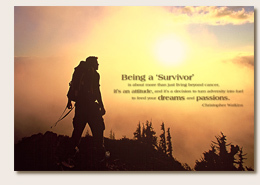 I was diagnosed with testicular cancer, pure seminoma, in October 2003. How did I find out? How did I know I had it? The first time I noticed something wrong was when I did a regular self-exam of my testes, and I noticed that one of them was half the size of the other! I thought it was weird but I didn't think much of it at the moment. Some time later — maybe a month? — the next thing I noticed was that the testicle had grown bigger (not yet normal size again), but the center was hard. That's when I was worried, and in the back of my mind I said, "Oh, *$%*, it's testicular cancer!" But I was in denial, and I was going through a very difficult time in my life, and to top it off I had no health insurance at the time. I didn't immediately go to the doctor because I was worried it might be nothing and I'd pay big medical bills for tests that would reveal nothing. I was so wrong! When I look back, I realize that I was slowly walking towards death. I had a time bomb ticking inside my scrotum! Finally, in October 2003, I had a new job and health insurance. By this time the cancerous testicle was completely hard, and it felt heavier than the healthy one. But I figured that if it were cancer, it would have been very large, like a grapefruit! Years ago, my doctor had told me that a testicle would grow really big really quick if I had TC. He said it could double in size in just a couple weeks, and that stood out in my memory. Until I found TC-Cancer.com, I had known very little about TC. This web site helped me find out sooo much more. I realized that there are many types of cancer and various signs and symptoms of any given cancer. On a Monday in October, I finally went to the doctor. He said the size was normal, but agreed the hardness was noteworthy. Tuesday, I had an ultrasound on the scrotum/testicles. Wednesday, I was at the urologist, and he asked me, "Can you come in for surgery tomorrow?" By Thursday, I had surgery to remove one of my testicles. It was all happening so fast, it was crazy. Looking back, I am glad the process was very rapid. What kind of treatment did I have? How did cancer affect my life? I was back in the gym working out only a couple months after surgery! I would like to share more than just the physical, medical side of the story. The story for me has a happy ending, and I believe that we don't simply need a doctor to heal us physically. The year that I had cancer was one of the worst times of my life. I had a horrible job, and I contracted mono only 6 months before I first noticed cancer. About a week before my diagnosis, I was depressed and wanted to give up on my dreams and my life. Something changed after I was treated and cured of cancer. I was so excited to pursue my dreams in life. I didn't think about whether I could or could not achieve them. I simply decided to go for it! I never went back to school either. Now I am a living a healthy life and working for myself full time as a portrait photographer. I have a quote that inspired me, and this is what I want to convey with the portraits.